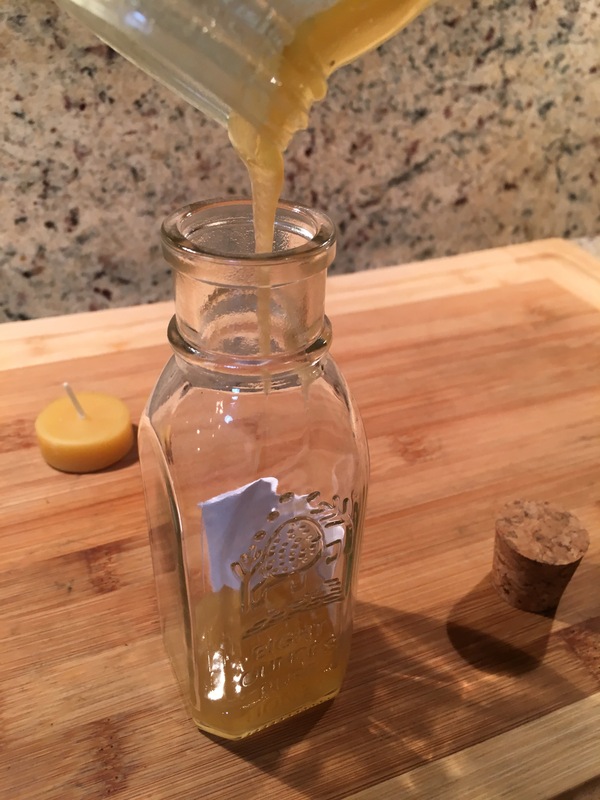 A honey jar is a wonderful magickal tool! It is especially useful for some aspect of your life that you wish to give ongoing energy over a long period of time. The trick to creating this type of spell is to focus on the positive (always a good idea) to sweeten things up and bring about positive change. A small jar with some sort of lid. 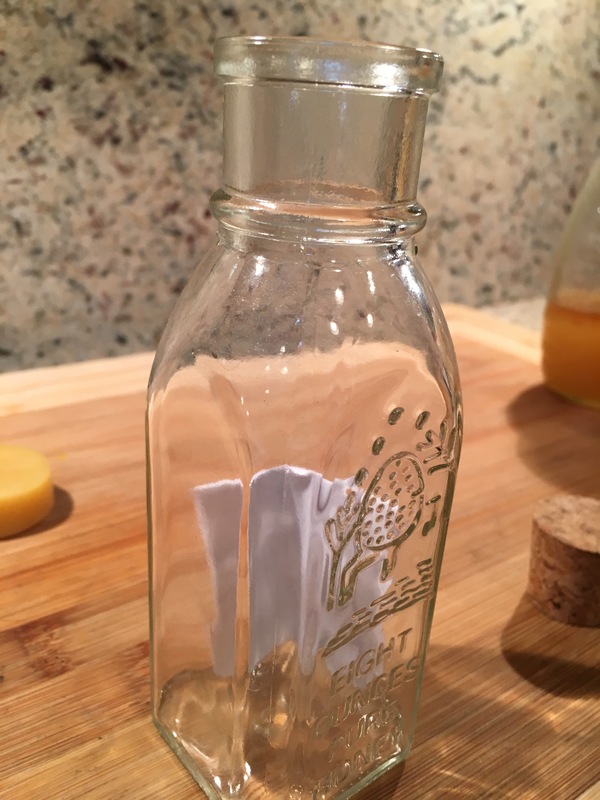 I found this cool honey jar with a cork, but a small canning jar will work just fine. Honey. High quality is good, unfiltered and organic, but don’t break the bank. The sweetness is what’s important. A pencil and a small piece of paper. A small candle of your choosing. 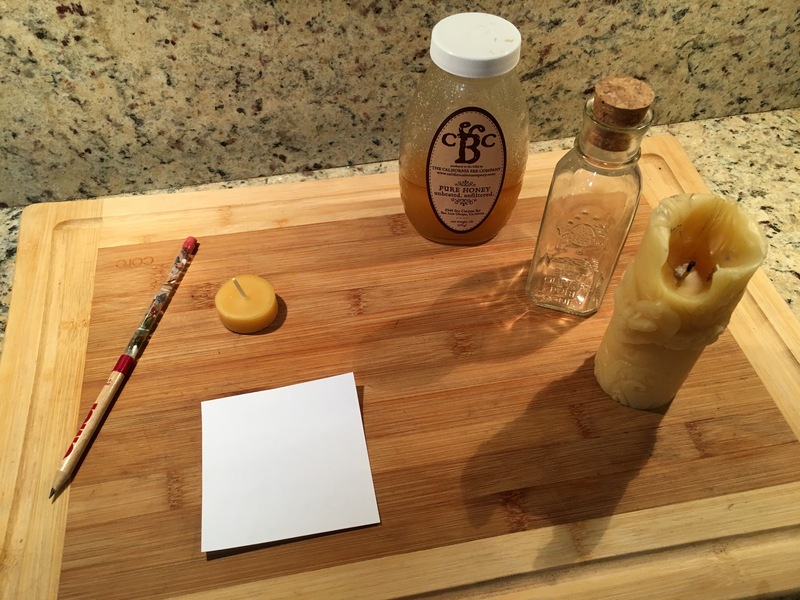 I used beeswax but your usual spell candles are ok.
Write on your paper, “Life is sweet because” and finish that statement with what you desire to sweeten in the present tense. 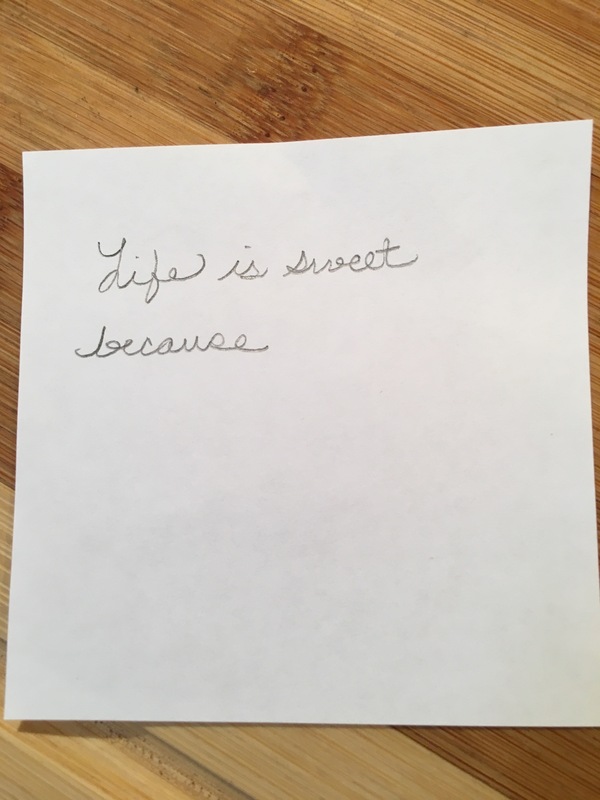 Example: “Life is sweet because I am employed in a job that brings me joy and financial prosperity.” Remember to state your desire in the present tense like you have it now. If you say “I will have…” it will always remain in the future. Make sense? Oh, and need I say it? I would not use a honey jar to bring about baneful magick as in, “Life is so sweet because my ex got struck by lightening”. Ahem….but that’s me. Fold the petition and place it in the jar. 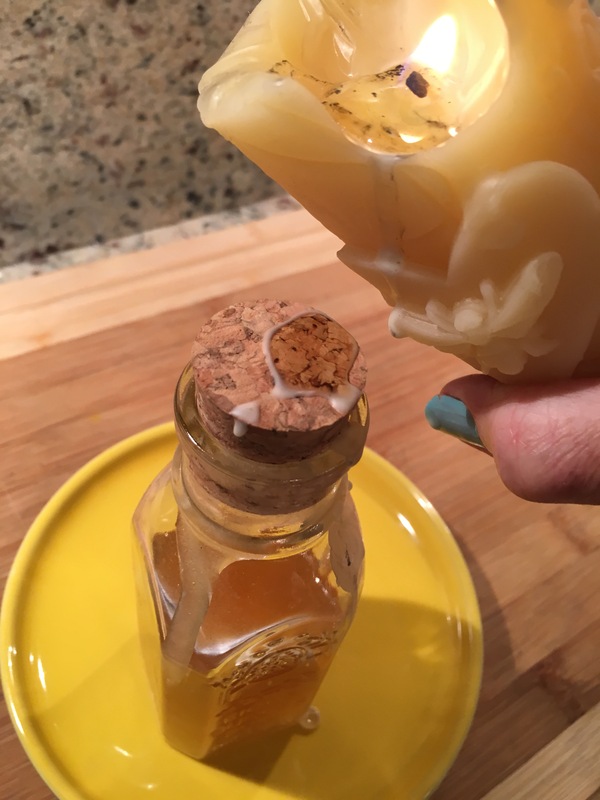 Pour honey over the paper to completely cover it. 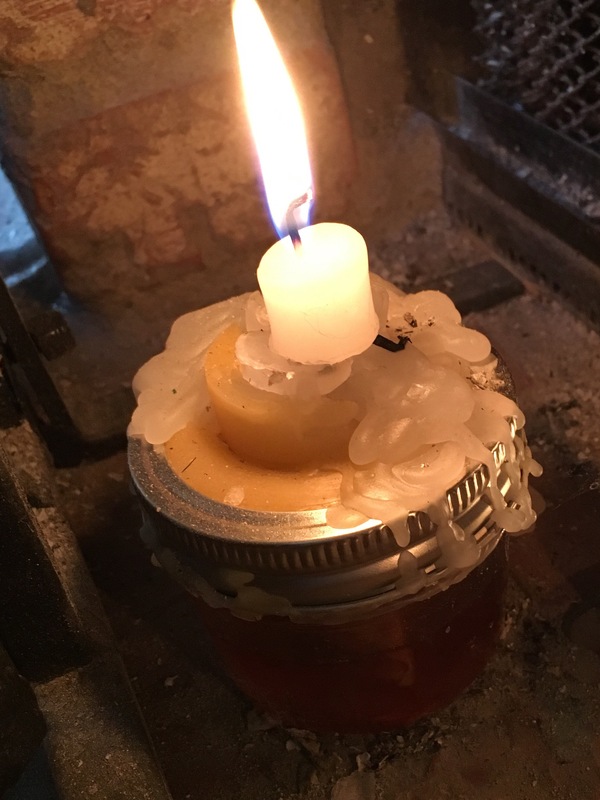 Now drip candle wax to seal around the lid of the jar and add a puddle of wax to the very top to affix a small candle. Bring sweet blessings to me! By the power of sweet honey and fire! Allow the wax to drip down the sides of the jar to seal your spell. 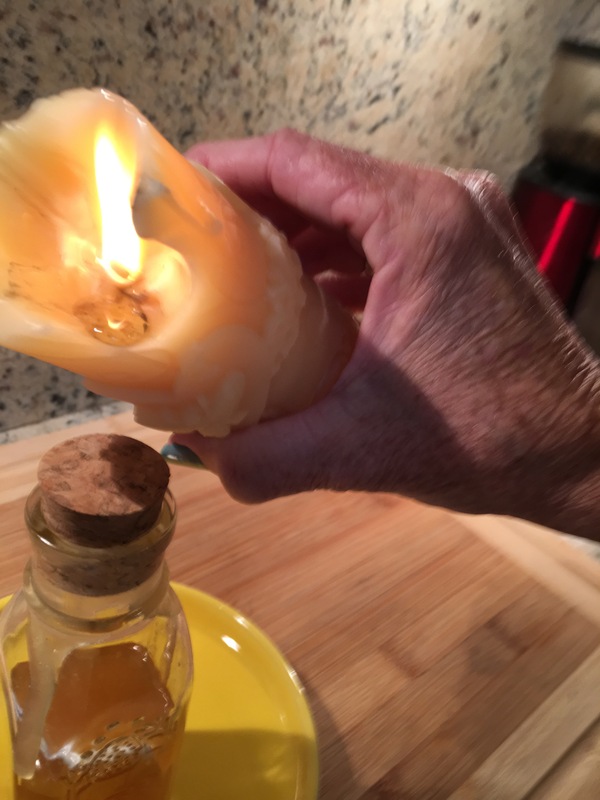 I place the jar on a candle plate or holder to catch the excess wax. Occasionally add a new candle to the jar to continue to “work” the spell. Use your intuition to tell you when you need to add and burn another candle. Here’s s humble little honey jar that I have worked for awhile with good results. This honey jar is that of a coven mate who adds a candle when she feels her energy starting to sag. And it’s “cheaper than therapy”, as they say. You can use a taper candle or tea light. You might even choose the candle according to its color energy. The blue one in the photo above was to bring peaceful energy. 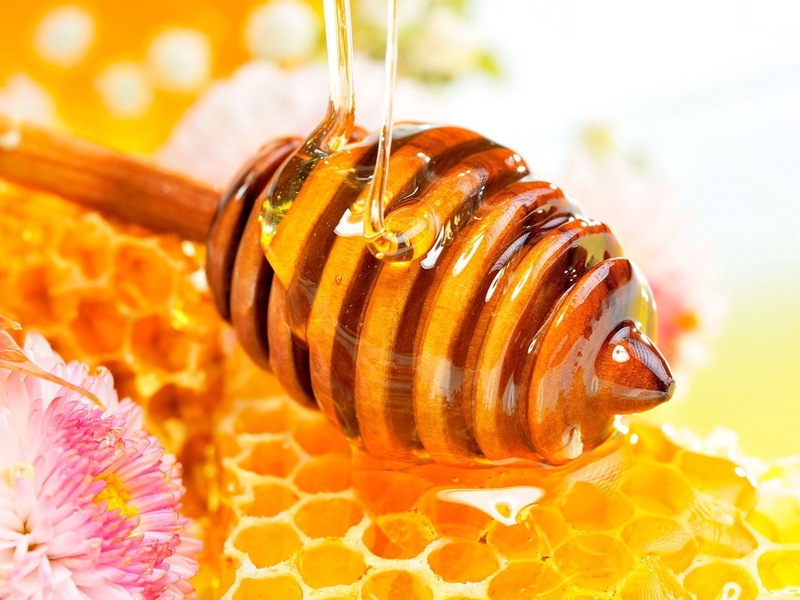 May the venerable honey bee sweeten your life as you work your honey jar magick! 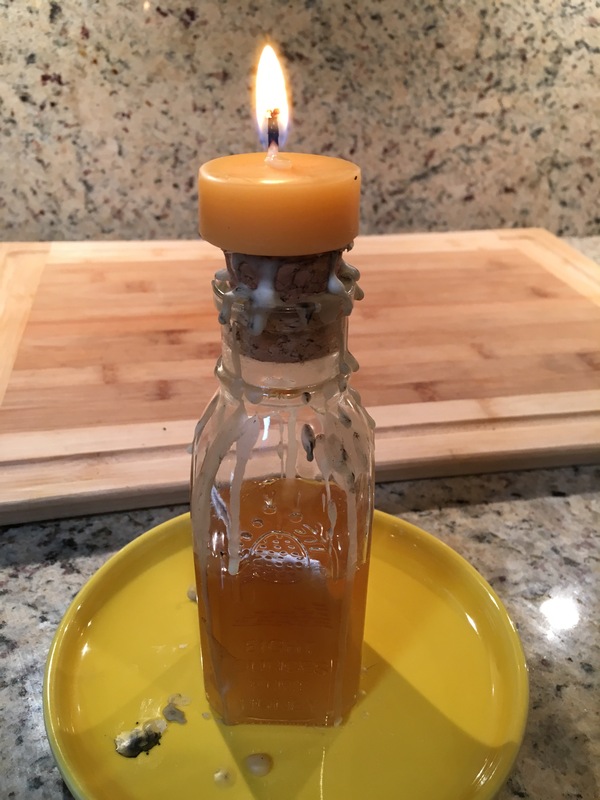 🐝 And please feel free to post your own ideas for casting a honey jar spell in the comments below. Midsummer greetings from The Magickal Cottage! 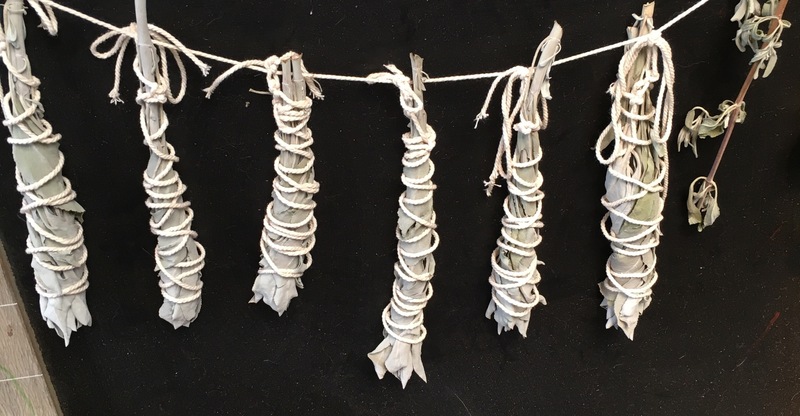 Our coven celebrated Litha here at Crow Hollow on June 20th, and we made herbal charm bags to capture that intense solar energy for channeling towards our individual purposes. Midsummer is the most magickal of times for harvesting herbs. It’s really quite logical! 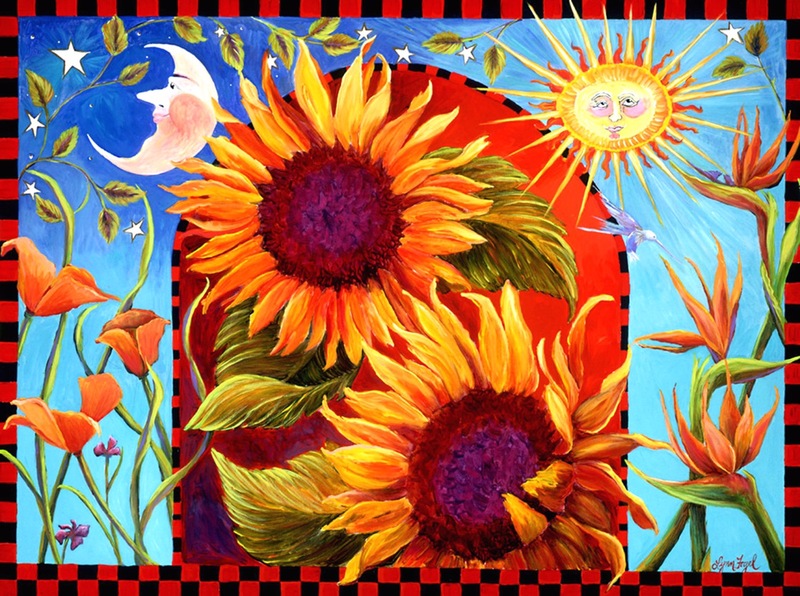 The longest day of the year will be giving our plant companions a super jolt of solar energy. What better time for an herbal harvest? This brings me to the topic of personal plant familiars. Most magickals have heard of animal or spirit familiars, but plant familiars? Yes, indeed! If you work with herbal energy or even magickal oils it just might benefit you to consider working with a plant familiar. How do you discover which plants are your familiars? 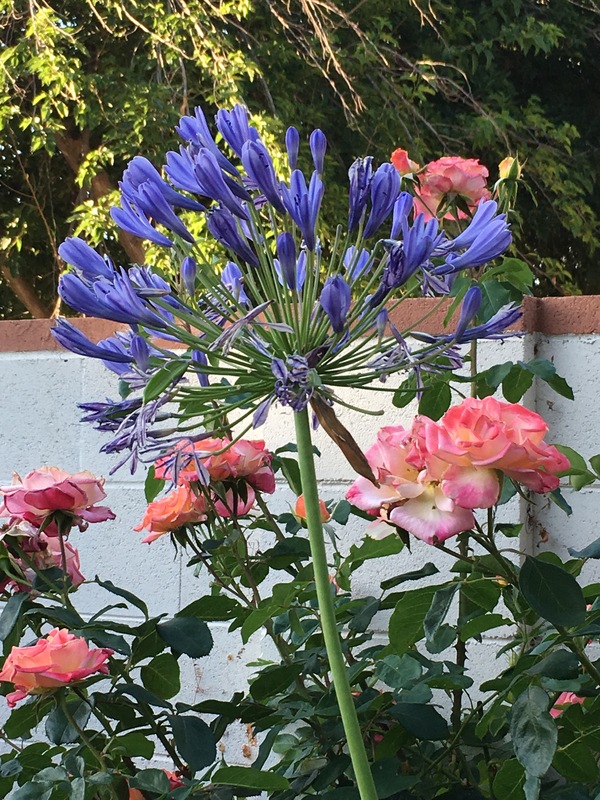 You might begin by considering which plants you are drawn to intuitively. I know one of my plant familiars is a rose. Roses make my heart sing. They always have, and I have grown hundreds of them. Roses are a great favorite of many people, but, on the other hand, I have seen people rip out entire rose beds to replace them with gravel or cement. This I can’t fathom. But that’s me…. I have other plant familiars besides the rose, but the rose has followed me to every home I have ever lived in. What do I mean by saying that it has followed me? That brings me to another way to find your plant familiar. If you have success growing a certain plant, then it might be your plant familiar. 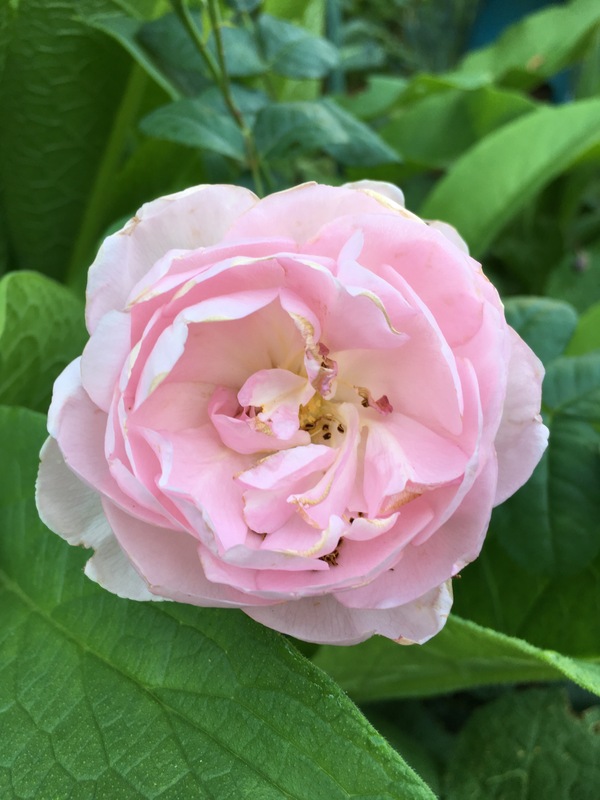 In Texas I at first couldn’t grow the usual hybrid tea roses I had grown in California, but then I discovered antique roses and a whole new world opened to me. So the roses taught me some wonderful lessons during those humid Texas summers. 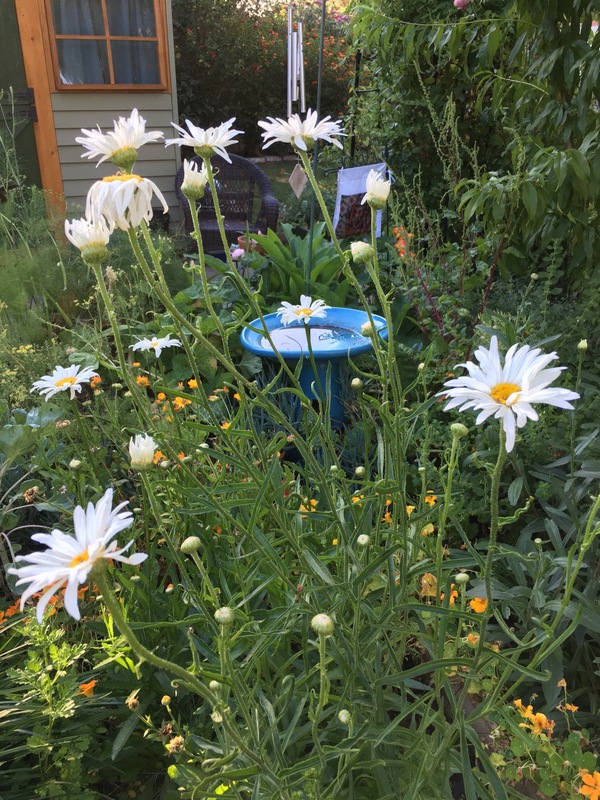 Shasta daisies sprang up from wild flower seeds and are all over the place! So consider this: my new Shasta daisy familiars have that same solar shape as the rudbeckia but are a luminous white. That’s something worth meditating on! 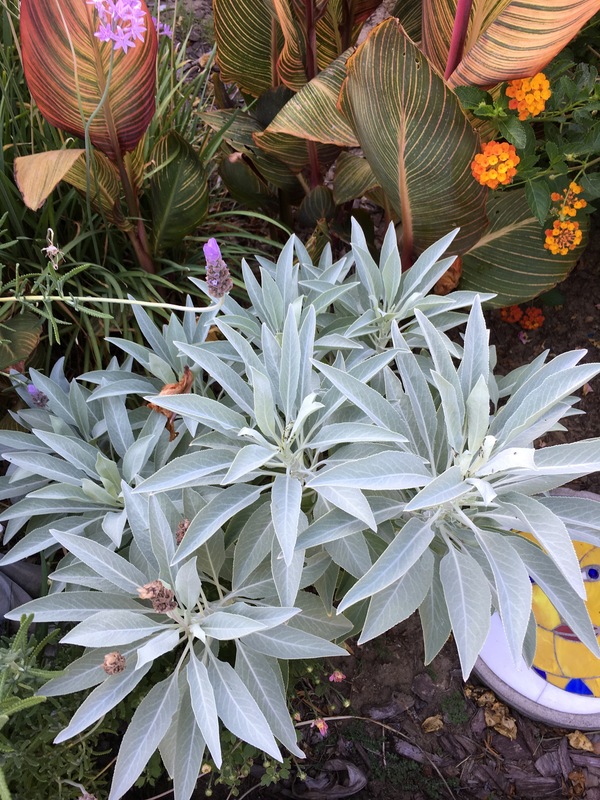 What changes have occurred in my life that are reflected in my plant familiar? A wonderful California native is familiar to magickals for the purpose of smudging. Salvia apiana, or white sage, grows in the dry canyons near where I live now. Lots of people around here try to grow white sage in their gardens, but it curls up and dies. It’s just a wild child and doesn’t like being told where to live! Lucky for me it has chosen to be my plant buddy. White sage is all over the place, along with its cousins blue sage, purple sage and black sage. I may never buy another smudge stick! My most recent adventure into the green world of plant familiars is High John the Conqueror. This magickal lovely is hard to come by as a garden plant. Cherished by hoodoo practitioners, the root is used a lot like mandrake root. I managed to purchase 5 seeds at a steep price and 2 have sprouted and look happy. They do resemble morning glories which can be invasive. So we shall see what comes of this new relationship. High John may have lots to teach me! So what does one do with a plant familiar? My first impulse is to explore the meanings and properties of the plant. In sympathetic magick the plant’s shape, scent, color and texture can tell a lot about the plant’s energy. Remember the solar shape of my daisy like friends? Sun energy with its forceful yang quality will definitely play a roll in this plant’s gift to you if you have such a plant totem. 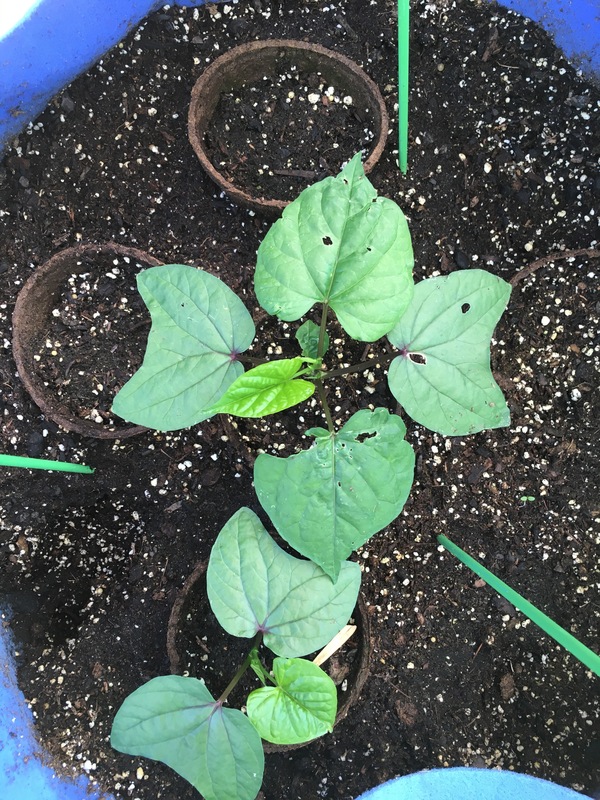 Does your plant familiar have round leaves suggesting a lunar energy? Are there mars like spines on your plant suggesting protection? 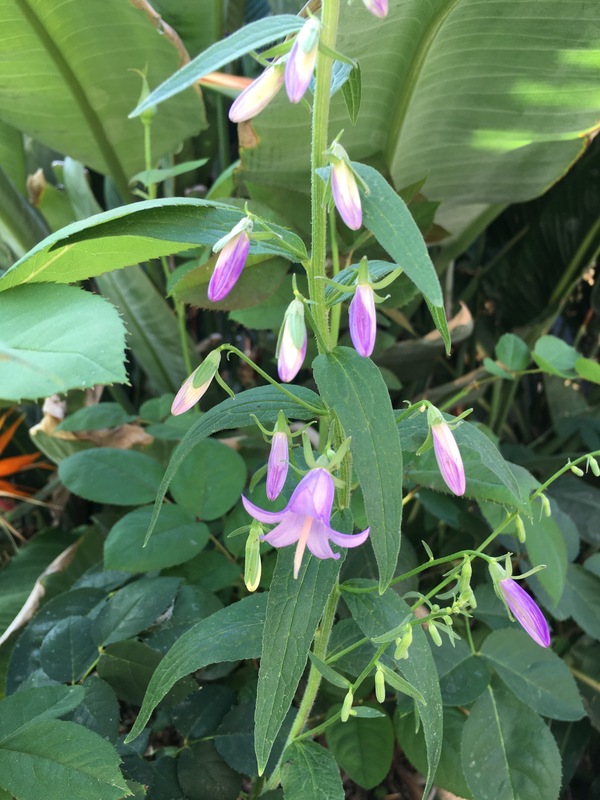 First consider your initial impression of the plant to see what qualities it may lend to your charm bags, candles, incense, etc..
A way to cross check your plant familiar’s energy is to do some research. Witchipedia has some wonderful resources. The realm of plant familiars is enchanting to explore! You can find tree familiars (think wand making) and commune with the dryads. The flower fairies in your cutting garden will delight and adorn you. And the aromatic properties of your herbal friends will add some powerful aid to your spells and charms. Enjoy the warm days and store up the energies of our present growing season if you live in the northern hemisphere, for they will serve you well when the days grow darker. It’s interesting that the fairy flowers all seem to be starting their bloom just before Beltane. I always think of Beltane as a “fairy fest”. is harebell. I seem to have an affinity for rabbits. 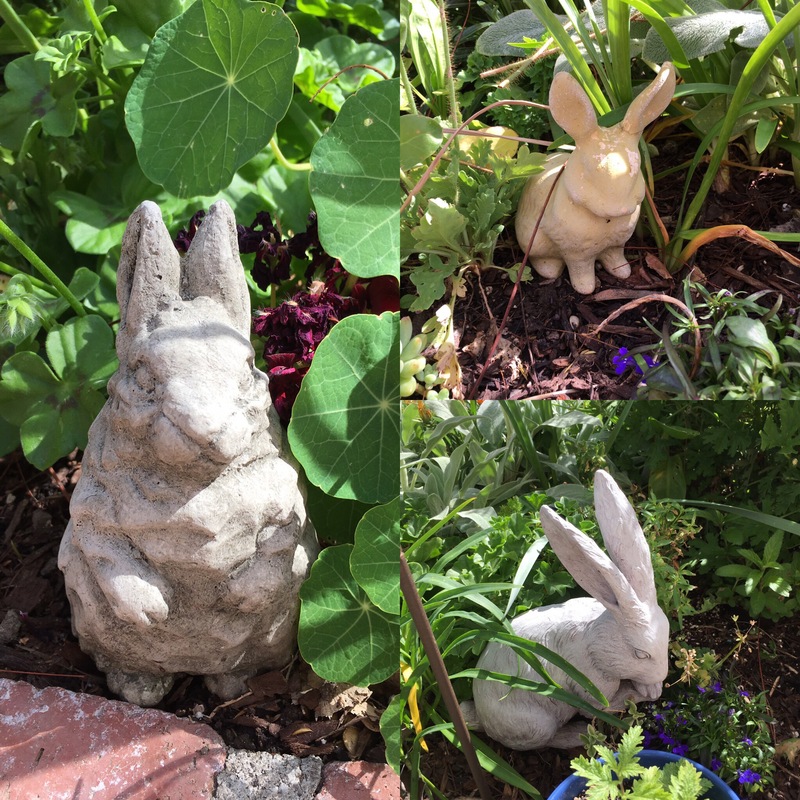 There is a delightful story about a rabbit (or hare) who rescued some fairies from some onery pixies. 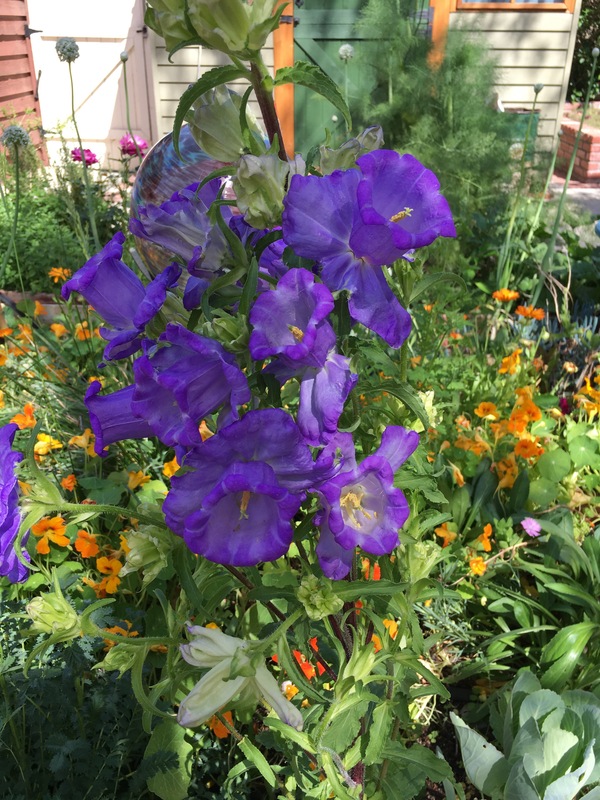 The fairy queen, in gratitude, gifted the rabbit and all his decendants the harebell flowers to grow in his meadow to ring and warn him when a fox was near by. See? Fairies are nice! I’m not quite sure about pixies, though. The other fairy flowers that are blooming now are foxgloves, or digitalis to be scientific. Goblin Gloves, Witches’ Gloves, Dead Men’s Bells, Fairy’s Glove, Gloves of Our Lady, Bloody Fingers, Virgin’s Glove, Fairy Caps, Folk’s Glove, Fairy Thimbles. If you didn’t already know, digitalis is quite toxic. Let’s be honest and say deadly. That’s probably why some call it dead men’s bells. 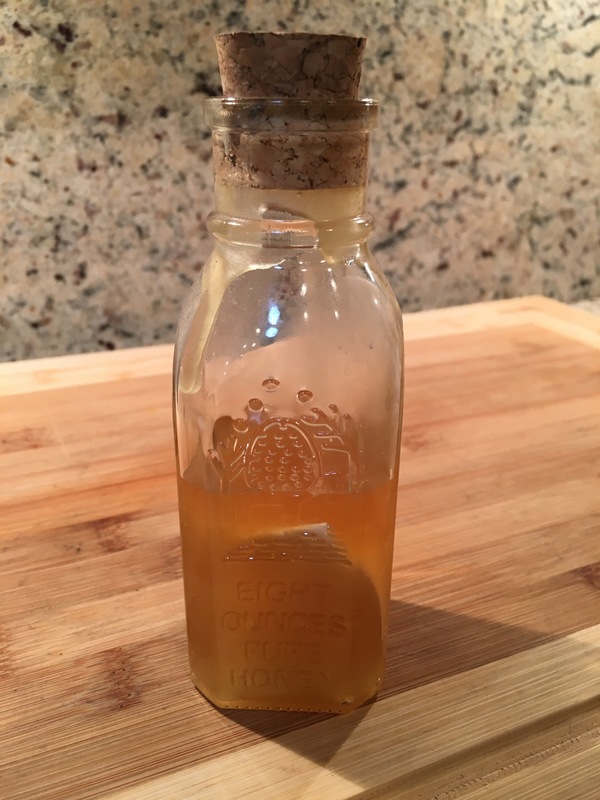 It’s true it is famous as a heart medication and has been used to treat other ailments, but it’s definitely not a DYI type of herbal ingredient. 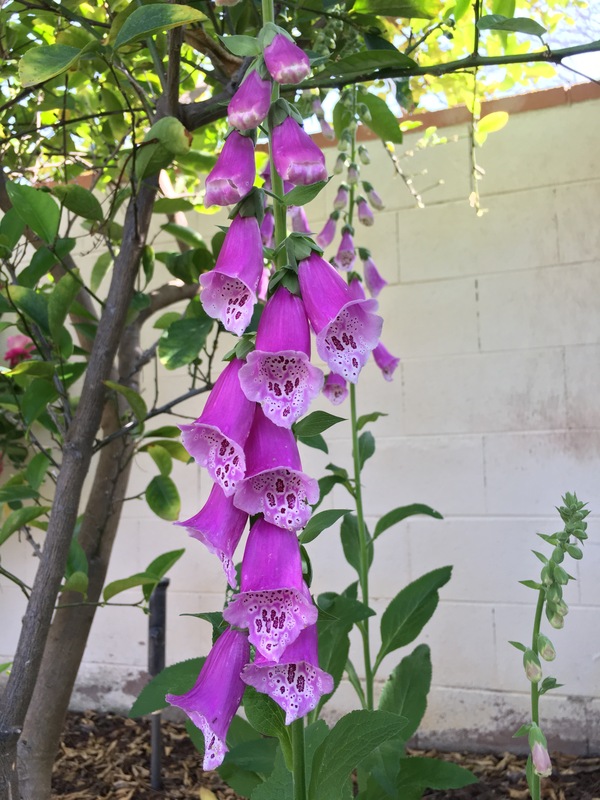 It has been said of digitalis, “It can raise the dead and can kill the living.” This may be the last year it grows in my back yard for awhile because of the grandkids. Hmmm….now the foxes get bells. Sounds like the fairies don’t play favorites! At any rate, foxgloves have long been associated with witches and witchcraft. And so, this brings us back to Beltane! This is a time when the elementals are very active. Yes, it’s a time when we celebrate and request fertility from the Lord and Lady. We hop over the Beltane fire to insure a prosperous year and likewise dance around the maypole. Next Sunday we will celebrate this ancient sabbatt in our coven. We will participate in all the traditional rites and rituals. Today, however, I got an urge to make something to honor the fae. 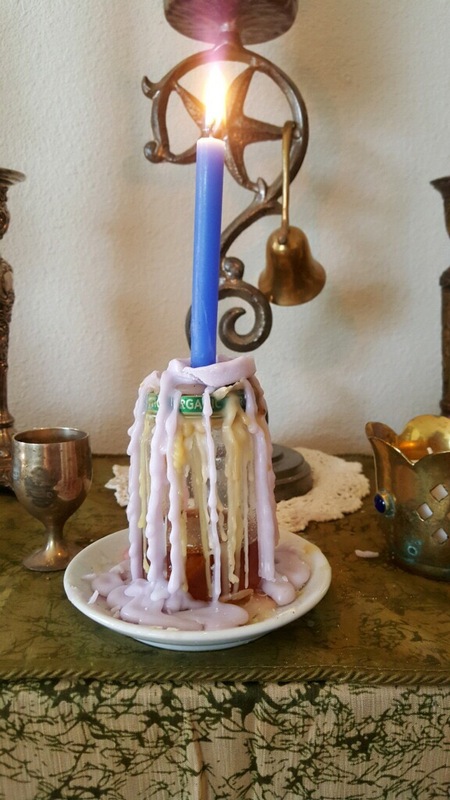 I decorated a candle for them to burn on our Beltane altar. It is dressed with blessing oil, lavender and roses and a 6 pointed fairy star. 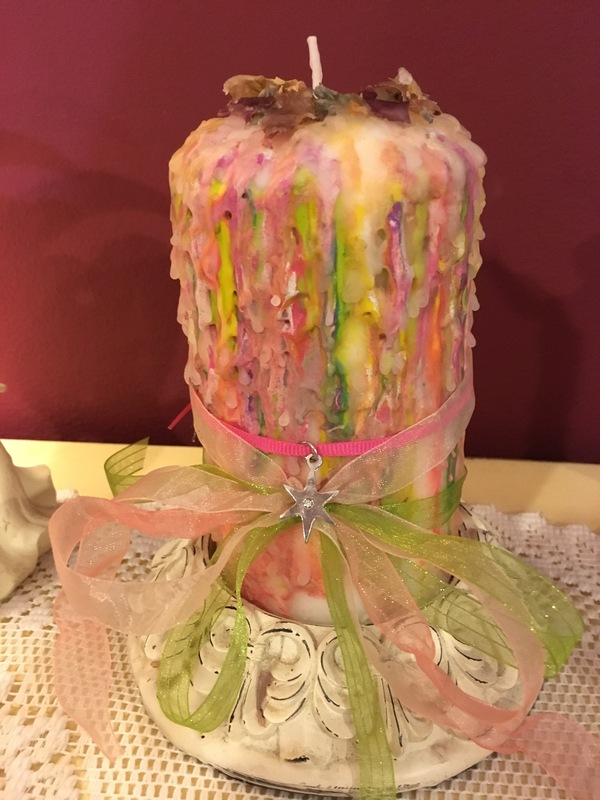 I chose what I felt were fairy colors and dripped colored wax over a white candle. Creating the candle felt very magickal and meditative. 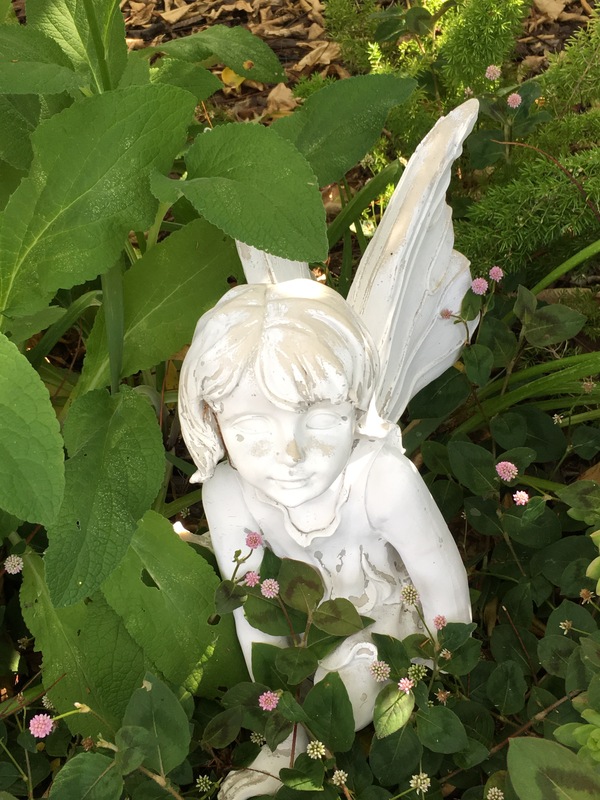 At Beltane why not take a moment or two to honor the fairies, those elementals that nurture the natural world to which we are intimately connected? I wish you all the magick and abundance that Beltane can bring! In a little over an hour I plan to take advantage of some powerful lunar eclipse energy and send another jolt of the peace and love vibrations to our Love/Peace egregore that is hovering over planet Earth. Remember last July we started this collection of thought forms (an egregore) to overshadow the fear based one that has had our planet under its oppressive influence? Our energy of love and peace has made a difference! I know some days it doesn’t seem that way, but the first thing I thought of on January 21st with the world wide peaceful marches was the egregore we had created. Since today there is a lunar eclipse, and he the magick is extra strong, I plan to join with coven mates and we will build the energy over a few hours to finally release it in the form of a giant quasar like burst to supplement the Love/Peace energy we started last summer. Eclipses contain the energy of all moon phases over about 4 hours. Search the web to find out the times for the lunar eclipse for February 10/11, 2017. The next lunar eclipse will be in August and we can do this same ritual again to keep the positive going. 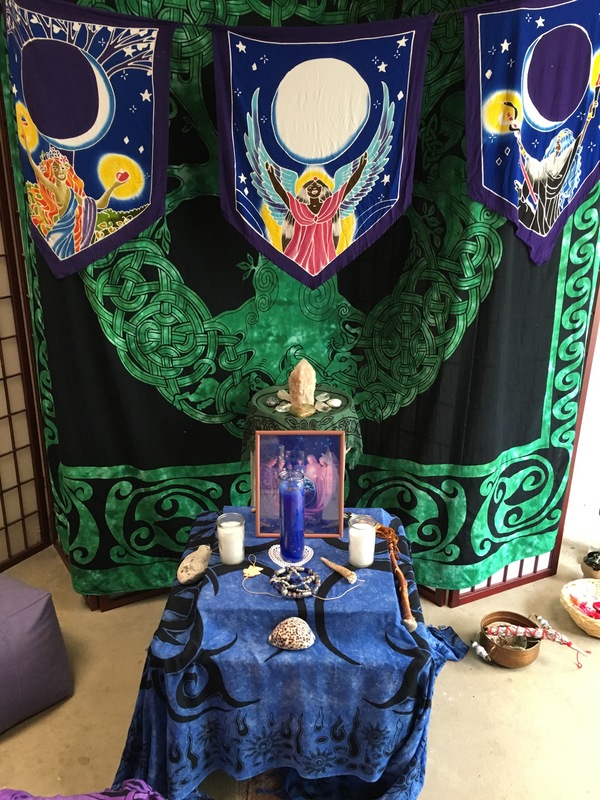 Please give a thought to whatever full moon ritual you are doing and join your love/peace energy with ours as we send it to heal blessed Gaia. Many thanks! Imbolc has marked the beginning of early spring here at the magickal cottage. 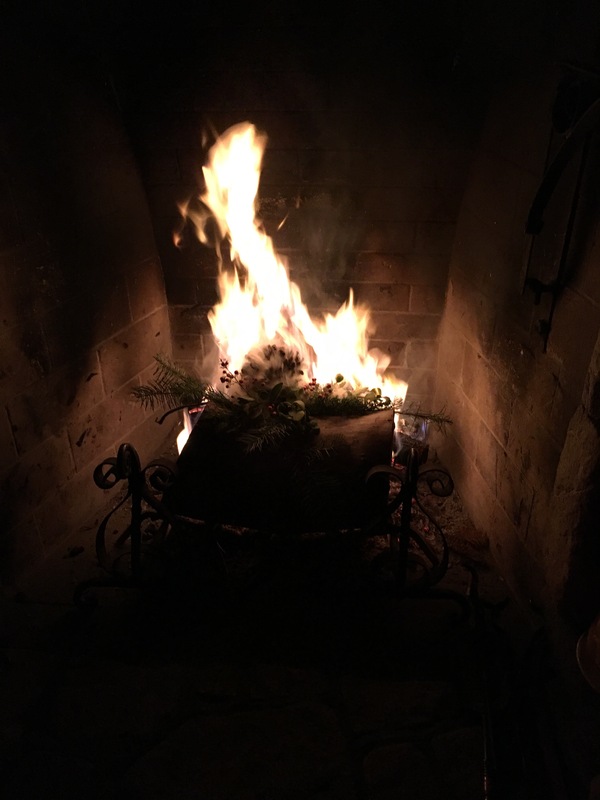 This particular Imbolc was special for me in that I was reborn into a first degree priestess with my new coven. Going from being a solitary for so many years to being part of a coven has been a rewarding experience indeed. The timing was right just as the timing dictates when the new lambs are birthed and the seeds begin to stir beneath the soil. 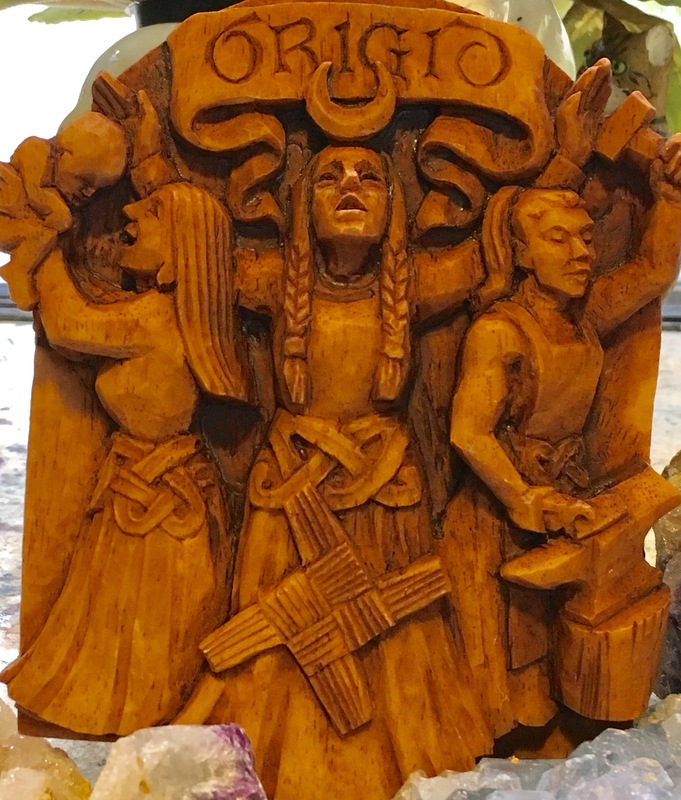 Our lady, Brigid, is the goddess of midwives and so associated with Imbolc. What new wishes are you birthing into your life? I, of course, am turning my attention to the garden, and as soon as the rain lets up I will lose myself outdoors. As I gaze out the window my mind paints pictures of the possible projects and changes soon to take place. I made several Brigid’s crosses this year. 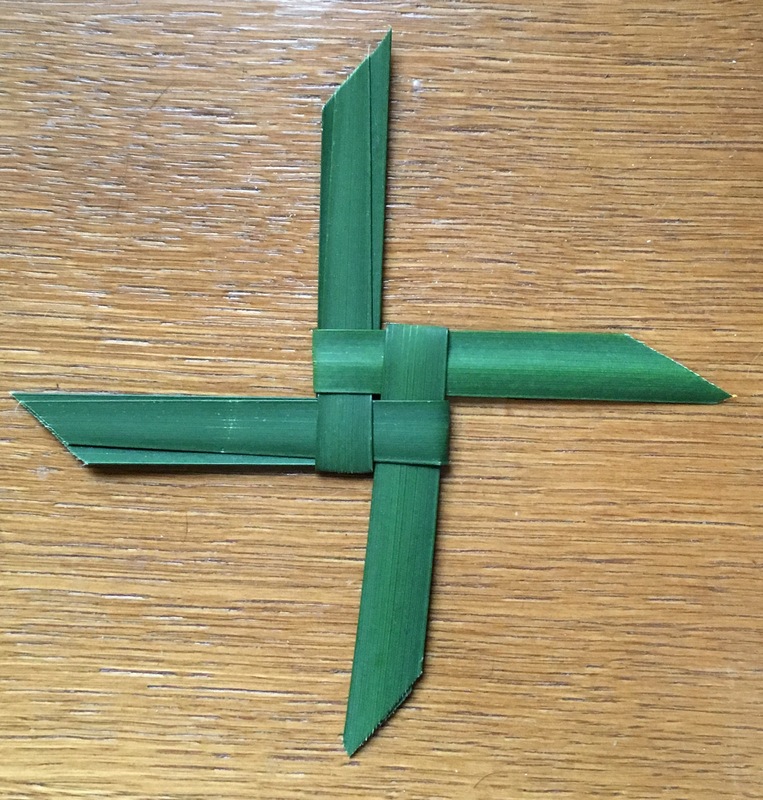 I was delighted to find that the leaves of poor man’s orchid, which grows in our yard in excess, works wonderfully for making the crosses. When folded over the leaves bend and don’t break. An ancient solar symbol, Brigid’s cross reminds us of the return of longer days and abundant growth. Where I live here in California the lemons ripen on our tree in January. 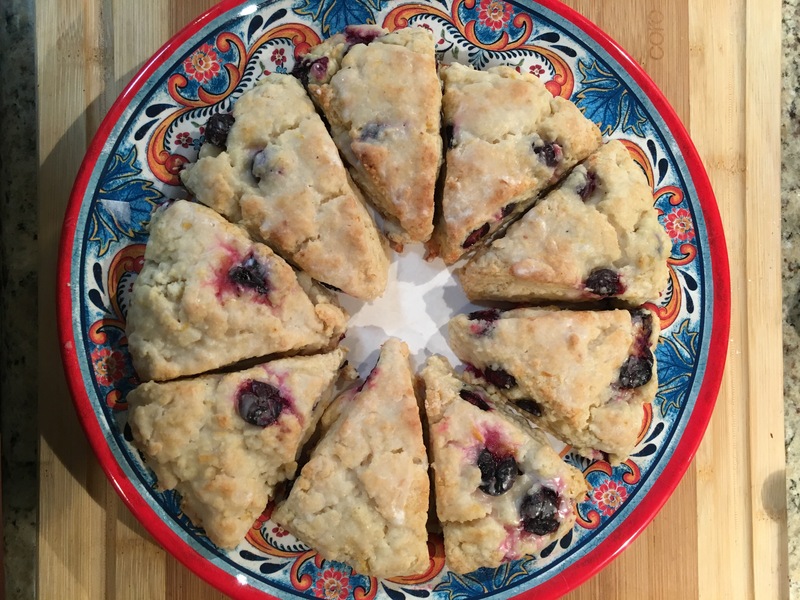 I usually end up giving many of them away on top of making lemonade, lemon pies and this year I made lemon blueberry scones and took them to our full moon ritual to share. Yes, to me January is about lemons and all they symbolize! Lemons are very cleansing and after all the holiday hubbub, I am ready for some physical and ritual scrubbing. In January I feel like going minimalist and cleaning out cupboards and behind furniture. I still have a lot of stuff, but after the Yule decorations are put away I feel like seeing calmer colors and bare table tops. Lemon is a great additive to a cleansing wash for floors and countertops. The juice or oil of lemon will raise the energetic vibration of people and places. The yellow color is very Mercury-like and I feel the flavor and smell of lemon can clear the cobwebs from your brain. After last fall and the mayhem in the muggle world I am needing a brain cleanse. How about you? Physically, lemon in water is very detoxifying and helps the body to release unhelpful buildup. Can we relate to holiday overindulgence? Thank the Goddess for lovely lemons! 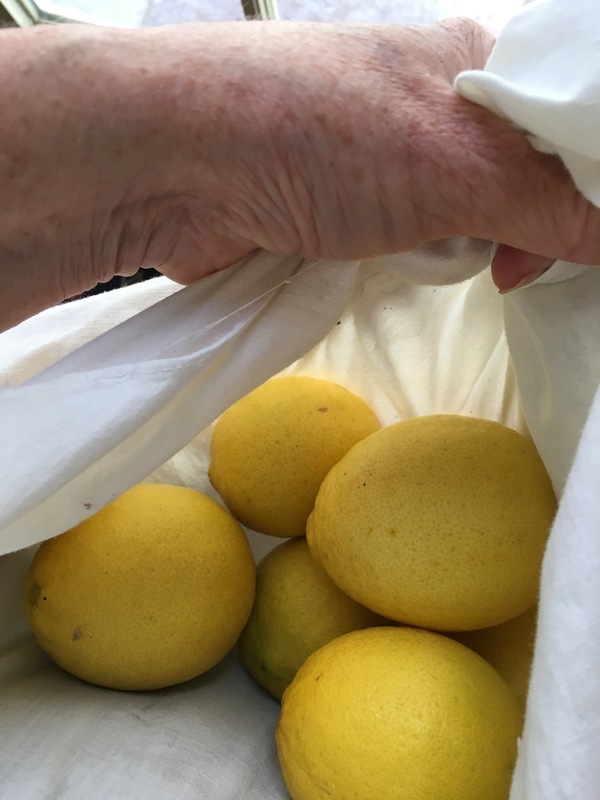 I know many people have snow rather than lemons in their yards right now, but lemons in some form are usually available almost everywhere these days. Actually, meditating on a silent white field could have a similar cleansing effect on body and spirit as you sip a lemony brew. “Bloom where you are planted”, I always say. Look around your space and acknowledge what you are being presented with at this moment in time. Do you have lemons or a snowy landscape or the sound of rain on your roof? What magick can you work with these blessings? With the return of the light at Yule may you move forward, renewed and ready to accomplish your goals for this journey around the sun!